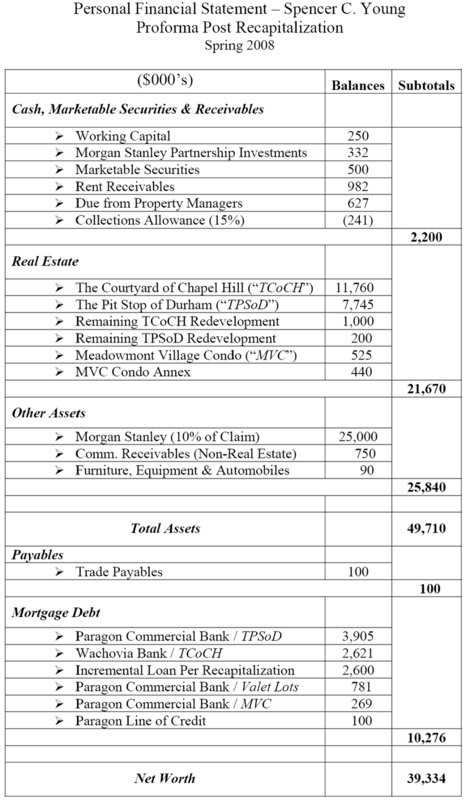 Below is the Proforma Net Worth of Mr. Young prepared in Spring 2008 and submitted to Martin Borden, his relationship banker at Paragon Commercial Bank. Had Paragon delivered on the Recapitalization as promised – or at the very least, the $250,000 over-collateralized line of credit – Mr. Young would have had the necessary liquidity at the time continue building value at his income producing properties, and avoid the maelstrom of negative credit events that ensued instead . . . and it was all maliciously orchestrated. As a result of Paragon’s failure to deliver as promised in 2008, and engaging in CRIMINAL FRAUD throughout 2009, what should have been a net worth of $39 million at this point, Paragon’s Machiavellian form of grand larceny threatens to wipe this out completely – and this is by design, pursuant to directives in the cover--up of MorganStanleyGate, which is a “far more significant matter” that “crosses state lines”.